Making bagels is one of those things people just don’t expect to be so easy. A bit time-consuming, but easy and worth the effort! I have made these bagels many times, and the last time I made them was Memorial Day weekend while my sister was in town. She went for a quick run one morning, (I say “quick”, but it wasn’t. It was 13 miles- a half marathon! She’s AWESOME!) and I thought she’d enjoy some fresh-out-of-the-oven bagels. (And she did.) My niece came by that afternoon also. Just to hang out with my kids and my sister’s foster daughter. They hung out, played some games and she marvelled at me actually making bagels from scratch. She called me an awesome cook. Yeah, my head got a little bigger that day. On this particular day, I created blueberry bagels (using a bag of dried blueberries) and cheese bagels (using a mixture of asiago and parmesan cheeses). There are still a few sitting in the freezer. I think my kids have forgotten that they are there. But my niece remembered. She was over a few nights ago and asked if she could steal a couple bagels before she left for work. Of course I said yes. Because what good is making the food if I’m not gonna share it, right? The bagel recipe follows… it uses a mix (that I also included the recipe for) and someday I’ll post other recipes that use this same mix. Enjoy! In a large bowl, dissolve yeast in 1-1/2 cups lukewarm water. Beat in 4-1/2 cups HOT ROLL MIX. Let rest 2 minutes. Add enough mix to make a very stiff dough. On a lightly floured surface knead dough until smooth, 5-10 minutes. Add more mix to surface as needed. Dough will be quite firm. Lightly butter bowl. Put dough in bowl and turn to butter top. Cover dough with a damp towel and let rise in a warm place until doubled in bulk, 30-45 minutes. Punch down dough; knead 4-5 times. Divide in half. Divide each half into 8 pieces. Shape each piece into a smooth ball. Flatten each ball with palm of hand. Holding a ball with both hands, force one thumb through center. Place bagel on lightly floured surface. Repeat with remaining dough. Cover lightly; let rise in a warm place 2-30 minutes. Lightly grease 2 baking sheets. Sprinkle with cornmeal; set aside. In a 5-qart pot, bring 3 quarts water to a boil. Add sugar. Lower hear to keep water boling gently. Use slotted spoon to carefully lower bagels, one at a time, into boiling water. Turning often, cook until slightly puffed, about 5 minutes. Add more water if necessary. Drain bagels briefly on paper towels. Preheat oven to 400F (205C). 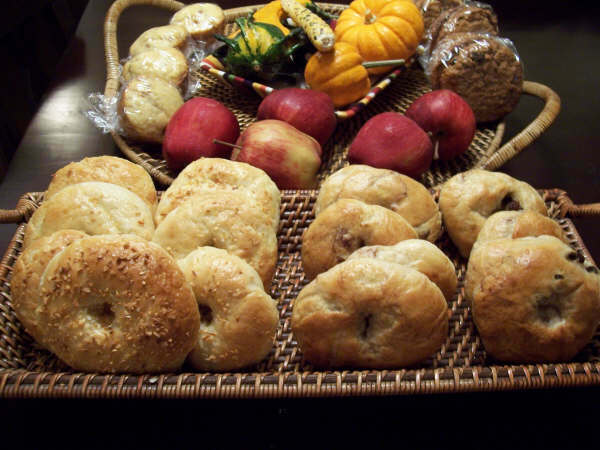 Arrange bagels, not touching, on prepared baking sheets. Combine egg yolk and 1 Tablespoon water. Brush bagels with egg yolk mixture. Leave plain, or sprinkle with poppy seeds, sesame seeds or coarse salt. Bake 15-20 minutes in oven until browned. Cool on a rack. Makes 16 bagels. My notes: Add more flavor! You are limited only by your imagination! · Mix in chives and garlic to the dough. Sprinkle with poppy seeds. Combine all ingredients in large bowl. Stir together to distribute evenly. Put in a large airtight container. Label with date and contents. Store in a cool, dry place. Use within 6-8 months. Makes about 22 cups Hot Roll Mix. Use 9 cups whole-wheat flour and 8 cups all-purpose flour instead of 20 cups all-purpose flour. Decrease sugar to 1 cup. Grandma’s Sweet Foundation Dough recipe didn’t come to me with good directions on fillings or toppings. So for several years, I’ve experimented with different fillings and icings. I have finally found the “winning” recipes in cookbooks I have had for many years. In order to use this filling for the entire sweet dough recipe, I quadruple the ingredients. I also like making my own sticky rolls or caramel rolls….